Bruxism is excessive teeth grinding or jaw clenching with symptoms such as hypersensitive teeth, aching jaw muscles, pain around the temporomandibular joint, headaches, tooth wear, damage to teeth and dental restorations. There are two types of bruxism: sleep bruxism and awake bruxism. People affected by bruxism are not necessarily aware of their condition because the contraction of the mastication muscles is unconscious. Some visible signs on the teeth are: abfraction (tooth tissue loss along the gingival margin caused by bio mechanical loading forces), gum recession and attrition (tooth wear with loss of tooth anatomy, flat and shorter teeth). 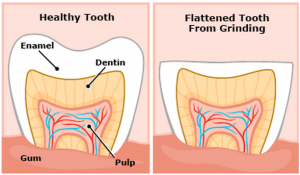 As the teeth become flatter and shorter, sensitivity may occur: the dental pulp containing the dental nerve is not as well protected by the layers of dentin and enamel tissues. Bruxism is a complex pathology and should be part of a multidisciplinary care. 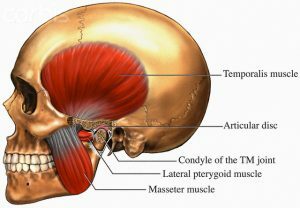 Injections of Botulinum Toxin (Botox) can partially paralyze the mastication muscles and lessen their ability to forcelly grind and clench while enabling normal activities such as talking and eating. These injections will also allow the dentist to restore the teeth with fillings, crowns, bridges, veneers, putting them less at risk of fracturing. Meet Dr Marie-Hélène Marion to know more about Bruxism et Botulinum Toxin. Working with osteopaths is also beneficial. Florence Pasteur, Osteopath takes into account the dental factors when treating body posture.